Rabbit polyclonal Smad2 (phospho S467) antibody. Validated in WB, ELISA, IHC and tested in Mouse, Rat, Human. Cited in 32 publication(s). Independently reviewed in 14 review(s). Synthetic peptide corresponding to Human Smad2. Our Abpromise guarantee covers the use of ab53100 in the following tested applications. WB 1/300 - 1/1000. Detects a band of approximately 58 kDa (predicted molecular weight: 58 kDa). 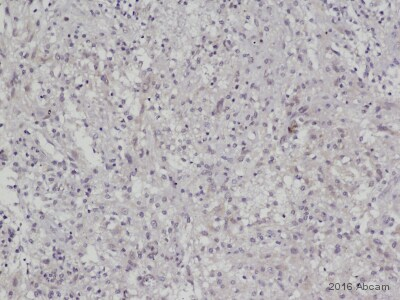 Immunohistochemistry (Formalin/PFA-fixed paraffin-embedded sections) analysis of human breast carcinoma tissue labeling Smad2 (phospho S467) with ab53100. The image on the right is blocked with a phosphopeptide. 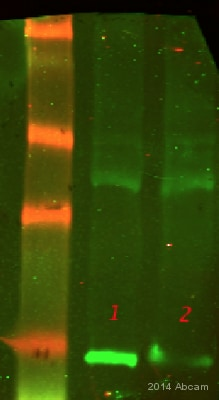 Western blot - Anti-Smad2 (phospho S467) antibody (ab53100)This image is courtesy of an anonymous Abreview. Additional bands at: 59 kDa. We are unsure as to the identity of these extra bands. ab53100 detecting phospho-Smad2 in Mouse brain samples by indirect ELISA. Samples were blocked with 5% BSA for 1 hour at 20°C and incubated with the primary antibody (1/750) for 4 hours at 20°C. 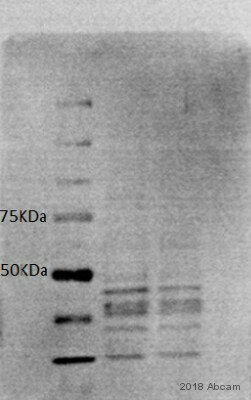 An HRP-conjugated Goat anti-rabbit IgG polyclonal (1/5000) was used as the secondary antibody. Publishing research using ab53100? Please let us know so that we can cite the reference in this datasheet. I can confirm that PMA is indeed Phorbol 12-myristate 13-acetate and it was used to induce the modification of Phospho-Smad2 at S467 site. Thank you very much for your reply. My colleague is out of the office this week, but I'll be happy to help you with this enquiry. Since we haven't tested ab119907 or ab53100 with bovine samples, we can't guarantee that they will cross-react and work in your assay. However we do have a testing discount program that you can use to try these antibodies. As part of our AbTrial program, if you submit your protocol and results to us as an online Abreview, we will give you a discount on a future purchase worth the purchase price of ab119907 and/or ab53100. I'd be happy to send more information about this program if you would like. I hope that this will be helpful, but if you have further questions or need anything else, please let me know and I'll be happy to assist you further. Have a nice day.